This PDF 1.4 document has been generated by Canva, and has been sent on pdf-archive.com on 19/06/2017 at 15:30, from IP address 213.218.x.x. The current document download page has been viewed 135 times. 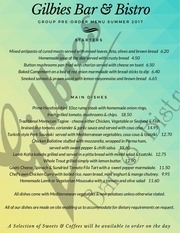 All dishes come with Mediterranean vegetables &amp; new potatoes unless otherwise stated. All of our dishes are made on site enabling us to accommodate for dietary requirements on request. This file has been shared by a user of PDF Archive. Document ID: 00613991.